For some people the coming months will feel to be the most difficult they have known, causing them to search for even a glimmer of hope, of respite from forces with which they feel unable to cope. At the same time, for others, there will be a heightened sense of their ingenuity and creativity, however unreal this may be. All is moving swiftly into the New Age and impress of Aquarius, whatever the ‘reading’ of this event. The impact of this will be powerful indeed. How then should men respond? Know this as a further step towards the New Time and in doing so await the appearance of the Great Lord. Open the gates of heart and mind and be prepared for the onslaught of the new. Q. Is Maitreya still appearing on Chinese television? Q. How many interviews have there been in China to date? A. Maitreya has given 34 interviews so far in China. Q. Is He appearing anywhere else other than China? A. Yes, in various large and smaller countries, near and far. Q. Is Maitreya still working in the Middle East? How is the response to Him and to His ideas? A. Yes. The response is complex and mixed. Q. Is it the case that the ordinary people in the countries where Maitreya is active respond more quickly and more positively than the leaders or officials? A. Not necessarily. It varies from country to country. Q. 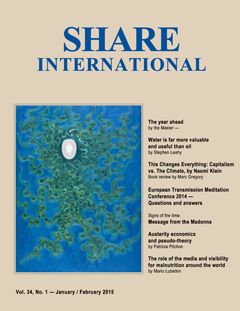 In the June  issue of Share International the letter titled ‘Message of Hope’ mentioned a date in connection with Maitreya’s emergence: January 2017. Does this mean that the Day of Declaration will take place then? A. That would be about one-and-a-half years from now if humanity responds well to Maitreya’s energies and His ideas between now and then. Maitreya has already said that the exact date is not known but that the time is set. Q. Will people who have previously seen Maitreya recognize Him when they see Him on the Day of Declaration? Q. When readers of Share International write letters about their experience with a spokesperson or a Master it appears that the Master or spokespeople seem very memorable, leaving people with a strong impression of ‘someone special’, as readers often put it. Q. (1) Why do statues weep oil or tears or blood; is it only as a ‘sign’ to the faithful? (2) Is it partly as a show of compassionate grief at the plight of suffering humanity? A. Both. It is a sign that something significant is being shown to humanity. Q. You have said that Maitreya will show humanity how far we have fallen – that we are somehow degraded and have ‘fallen’ from an earlier superior state. What happened? How and when did we ‘fall’? How can we ‘recover’? A. There was a time when humanity lived as one – for example there was a time when there was no word for stealing; it didn’t exist. We can ‘recover’ by becoming one again. Q. Why does Share International place so much emphasis on ‘people power’? Is it so important? Why? A. Yes, it is crucially important because it is the people who have to be ready for change in the world, and ready to bring it about. Q. Do ‘angels’ really have wings? Or is that idea just symbolic? A. Angels sometimes have wings and sometimes don’t. But they are not used for flying! Q. What is a ‘guardian angel’? Do they really guard humans? A. Every person has a ‘guardian angel’ whose role is to keep the person safe. Q. With a very small Transmission Meditation group, life often hinders weekly meetings and a question has arisen in our group, whether the Masters are disturbed by irregular meetings and whether it is better therefore to not meet for Transmission Meditation at all or continue to meet, even if irregularly? A. Keep going. It would be good to continue as you are; however, it would be better, if you can make it regular! Q. Is it a good idea to present information about the emergence of Maitreya and the Masters of Wisdom to primary school children? If so, should it be presented as an alternative religious study? Some say this is dishonest – since it is presenting the information under “false pretences”? A. Religious teaching in general should not be given to children under the age of 14. On Saturday 6 June 2015 I was leaving the Share International office in London to travel to Bournemouth to give a talk to the Theosophical Society. A middle-aged, grey-haired, taxi-driver drove me to the station with the heavy suitcase and portfolio. “Opening up a gallery?” he asked looking at the portfolio. “Yes, we are actually!” I replied, mentioning the Benjamin Creme Museum that has just secured a gallery space, and is opening in a few months’ time, near Los Angeles, California. We headed off and the driver remarked that the Labour Party didn’t do well in the recent election. We talked about the Labour Party, the shocking election results, and agreed that a small, rich elite has far too much power in the UK. When I said I support the Green Party, he agreed they had good policies, but wondered if enough people back them. We agreed that proportional representation was needed for real change. As we drove along an impatient lorry driver was intent on pushing out in front of us. “We don’t want to fight him do we? We want peace. What a crazy world it is!” he joked. He kept saying what a crazy world it is. Talking about people working too hard he said he’d recently bought a plasma TV for his family, and now he has to work like a donkey to pay it off! He told me he was from Yugoslavia and that as a student he’d read a lot of Karl Marx, and found his ideas very interesting. I spoke about sharing the world’s resources, and he asked: “But aren’t people too greedy and selfish to share?” I explained about the imminent world stock-market crash, which will bring huge change, and chatted about the Masters and Their return. He found it all really interesting and hopeful. Then he suddenly mentioned what a nice place Bournemouth is! Asking how he knew I was going there, he laughed and asked why I was going there? I said I was giving a talk about Maitreya and the Masters; that Maitreya is the World Teacher for all people; and about Benjamin Creme’s role and his work. He said what an important man Mr Creme is; he is a great teacher, and that he has taught me well. He emphasized several times how important it is to continue telling people this information, to keep working hard, and repeated how interesting the information is. At the station we exchanged goodbyes. Heading off I felt slightly choked, as he’d given me such an unexpected boost. On the train I thought of the effect our information has on people hearing it for the first time, and what a wonderful opportunity it is to present it to this “crazy world”. His encouragement was with me as I gave the talk. Could your Master say if the taxi-driver was a Master? (1) On 4 June 2015, some members of the German groups joined the demonstration in Munich against the policies of the G7; around 40,000 people marched peacefully and enthusiastically. We had one banner with ‘S.O.P. – Save Our Planet’ and at the beginning of the demonstration an elderly man asked me if I speak English, because he was from London. "This is the MAIN TOPIC – your banner! It is so WONDERFUL!" He was quite excited and happy to meet us. "Thank you for being here! I am so happy to meet you here! We, in London, also have very good demonstrations! It is so important to be here!" he continued. I had only German material, luckily with the English website on it, so I recommended it to him. I explained a little bit about our background, that we believe that humanity is supported by a group of wise men. Suddenly he quoted some words of Jesus from the Bible, and laughingly I replied that Jesus is also part of this group of wise men. And that they will work openly. We exchanged our ideas, that there would be no ‘Saviour’ in a Christian sense, but that we all together must save the world by ourselves. He asked about my name and told me that his name is Chris. At the end he said a hearty goodbye: "I wish you a very good demonstration! And that your dreams may come true!" May I ask you if that man was just a tourist from London? (2) On 9 and 10 May 2015 we participated in the Yoga Festival in Merano, northern Italy. Most people in this region speak both Italian and German. I only know a little bit of Italian, so my two colleagues spoke with Italian people. When I was alone at the stand, two elegant Italian ladies came to our booth and asked me a lot of questions in Italian. I did my best, tried speaking also in English, which they did not really understand – finally we ended up with French. It worked well, and I said to the first lady that I liked this Festival very much and that I would enjoy doing a little bit of yoga. She replied: "You know that you do not need it!" Her tone was a bit surprising. Then this lady asked me if I could explain the relationship between Blavatsky, Bailey and Benjamin Creme – pointing at our banner with photographs of all of them. I explained it to her. She asked a lot of questions and this was quite challenging for me – in French (in fact, by coincidence, I’m trying to improve my French-speaking skills at the moment). Suddenly my Italian-speaking colleague came back and I suggested to the lady to speak Italian with her, it would be easier. She insisted: "Don't you like to speak French with me any longer?" I smiled and our conversation went on. She thanked me with a smile. The whole conversation was a bit like being ‘tested’ somehow. Was this lady – and her friend – just a nice visitor? We recently (beginning in mid-May) mounted an exhibition at the Share Nederland/International Information Centre in Amsterdam of colour photographs illustrative of the need to implement Maitreya’s priorities. The images were accompanied by quotations by Maitreya, Benjamin Creme’s Master, Benjamin Creme and one or two other well-known figures. We chose an exhibition, for a change, knowing that it is an easy way to engage with the public, and that it creates an opportunity to explain our information in an informal setting. There was a lovely atmosphere at the ‘grand opening’ of the exhibition. On that day two men from Ghana suddenly came in, stayed for several hours, looked at the photos, were interested and supportive, made comments and asked questions. Members of the Dutch group spent a considerable time talking to them about Maitreya’s emergence and His priorities; they also explained about signs and miracles around the world, as well as Maitreya’s ‘Hand’ card. One of the men was given Maitreya’s ‘Hand’ card which he carefully put away in an inside pocket of his jacket. The men were also interested in Maitreya’s appearance in Kenya and were shown cards of the Nairobi photographs. One of the men said he would return some time, and commented on the importance of the ideas of justice, sharing and caring for our planet, and said what a good exhibition it was. Both men seemed to feel very comfortable with us. They also seemed familiar somehow. One of the Dutch group said that although his English is a little limited he was able to communicate very well with one of the visitors from Ghana. Were they possibly spokesmen for the Masters? Members of the Dutch group, Amsterdam, Holland. After the meeting, the woman approached me in the lobby and said that she was really glad she came today and it was a wonderful talk. She didn’t seem to want to leave at all, so I suggested she sit down on a chair nearby, because she was leaning on her cane, and holding the trolley with her left hand. She then asked me: “Do you really believe this story? How can you believe this?” She looked at me seriously and seemed to want to know what I really thought, my inner thought. I responded seriously. She said she had asked Christian ministers and Buddhist sects, but their answers were all “No”! Why do you think they deny the story, she asked, looking straight into my eyes? I said that Christianity teaches love, Buddhism teaches right human relationship, but the Reappearance of the Christ or the Return of Miroku Bosatu (Maitreya Buddha) is a far away future event for them … that’s the difference! But our information is that it is already happening, I said. As I found myself more and more emphatic, I changed the subject, and complimented her red coat. She said she was 80 years old, and lived near the address written on the pamphlet we gave her at the reception desk. She asked my age and where I lived. I said I lived in Shiga. She said she knew a bookshop in Shiga. I said that was our house, feeling amazed how she would know. She seemed impressed that we are all volunteers. She enquired about Transmission Meditation as well. She finally got up to leave after about 40 minutes. My husband who was outside, helped her carry the trolley down the stairs because she could not pull it and walk down with her cane. At the bottom of the steps, a brand new bright red electric senior buggy was parked and she drove off on that. However, we wondered afterwards, how could she have driven here in that little buggy in heavy traffic, all the way from her home where she said she lived, and there was no space to put the shopping trolley on it. May I ask who was the lady in the red coat? (2) On Monday evening, 18 May 2015, Michiko Ishikawa arrived in Osaka and asked if it’s possible to change the wording of the newspaper ad for her talk on Saturday in Osaka, because she wanted to refer to the special municipal election being held there a day before – for change or to keep the status quo. We immediately asked our ad agent to search for any space of any size on any paper (with a last minute cancellation). Shortly, the agent phoned back rather excitedly that he had found a space for a large colour spot (almost a quarter of a page) on Thursday issue, three days ahead. They hadn’t even noticed there was a space. He asked how much could we pay. I said we don’t have much left and gave him the lowest possible price. To my real surprise, he said: “OK, let’s do it. Send us the ad copy by Wednesday evening.” It was the paper with 500,000 circulation, covering the entire Osaka area, and the price was only a fraction of the normal cost. Michiko Ishikawa quickly composed the ad, rewriting many times in order to make sure that the ad content would be accepted, but would still convey enough information. (The newspaper company normally would not accept any ad with any hint of a political or religious tone.) With the dedication and hard work of the volunteers, the ad was redesigned and submitted and passed the inspection, and successfully appeared on Thursday’s morning paper, two days before the event. We believe it was a miracle that there was such a large ad space available, and for such a small fee, and our ‘opinion ad’ was prominently published in colour. Will you please tell me if we received any special help? On 11 May 2015 Mrs Funke Adamson, a traditional worshipper, gave birth in Apapa, Lagos, Nigeria, to a baby girl who was born holding white ‘Ileke’ beads (Yoruba name) in her hands. A Transmission Meditation group in Paranaque, the Philippines, recently experienced something miraculous happening in their two vases of plastic plants with flowers, which they put on display beside the Cross of Light every time they perform Transmission Meditation on Sundays. At first it is noticed by a co-worker just after Holy Week this year  that she thought there are some small changes in the plastic plant, so she counts all existing flower buds to make sure that her mind is not playing tricks on her. But another day when she checks it again to her surprise the buds have grown and multiplied despite being plastic, and also noticeable small stems are starting to sprout as if the plastic plant is alive and behaving like a real plant. Until now it is said to continue to grow. Can you please tell us what is going on? R. R.A., Pasig City, Philippines. A statue of the Madonna has been shedding tears in a house in Kampung Mahandoi, Penampang, Malaysia. The 33 cm high statue was only recently brought to the house and blessed by Archbishop John Wong (head of the Sabah Catholic church in Sabah) when he celebrated mass at the Our Lady Queen of Peace Church at Kampung Kobusak. Around 100 people a day have been visiting the house to take part in rosary prayers in front of the statue, after word spread about the miracle via social media. A light blessing from the Master Jesus on a photograph of the demonstrators’ camp, in Munich, during the G7 summit in June 2015. China – A glowing white UFO that changed shape while hovering over a Buddhist temple in China was filmed by the temple’s video camera on 29 May 2015. A security alarm went off at 11pm at the Baita Temple in Anhui province. Father Shi Xingkong was on security duty and went to investigate. He checked the security camera’s video which shows a bright object – hovering over the temple, changing shapes and even briefly flying inside the temple. The UFO then begins to rotate and moves rapidly outside the camera’s view. To the monks it looked variously like an apple, a flying-saucer and a sitting Buddha. Whatever the object was, it must have had some mass since it set off the temple’s infrared alarm. (Benjamin Creme’s Master confirms that the ‘glowing white UFO’ was a spacecraft from Mars. We present a selection of quotations on the theme of ‘The Day of Declaration’ taken from Maitreya (Messages from Maitreya the Christ and Maitreya’s Teachings – The Laws of Life), Benjamin Creme’s Master (A Master Speaks and Share International), and Benjamin Creme’s writings. When Maitreya appears before the world people will realize that they have known Him from before, and that His teaching is not strange or beyond their level of thought. Simple, indeed, will He be that all may understand. Precisely His simplicity will astound. Nevertheless it will be found also that most people will experience what they hear in a new way, as a dawning truth, new and touching them at a deeper level. Simple the ideas may be, but they will resonate in people’s hearts and feel fresh and vibrant…. The people will grow in power and their voices, potentized by Maitreya, will grow in strength and clarity of demand. They will call for their Spokesman to speak to the world and the stage will be set for the Day of Declaration, the first day of the New Dawn. The Day of Declaration will be announced by the media. People will tune in at the given time, and see Maitreya’s face, by now well known. As it says in the Christian Bible: “Every eye shall see Him” – on the linked television networks. They are in place for this event so that for the first time in history the World Teacher can address every individual directly, needing no churches or priests to act as intermediaries…. When all is ready and prepared, when world events have signalled their warning to men, Maitreya will step forward and claim His rightful place as Teacher. From that point onwards, a new spirit of co-operation will make its appearance and lead to the rapid transformation of all our structures. Men will accept the guiding wisdom which His spiritual status confers, and stage by stage, in mounting momentum, will remake their lives in relation to the spiritual blueprint with which He will endow the world. Preparations are well in hand for Maitreya to speak to the world via satellite television. Every nation and country will be linked by satellite to experience the presence and teachings of Maitreya. Those who watch, listen and respond will find themselves gradually undergoing transformation. On the Day of Declaration “people will enter churches, temples and mosques, and church bells will ring”. It will be a day of rejoicing…. When enough people are following, not Maitreya, but the thoughts, the ideas, the advice of Maitreya, He will be invited to speak to the entire world on what we will call the Day of Declaration. On that day Maitreya will appear on the television sets of everyone at the same time throughout the world. He will address the world, but will not actually speak. Maitreya will show the high level from which we have fallen, into the mediocrity of materialism today. And He will show the way forward, through the acceptance of the principle of sharing, declaring our sense of the one brotherhood and sisterhood of humanity, enabling us to set out again on the spiritual path, the path that leads not to competition but to oneness. That is what the New Age is about, the Age of Synthesis. Synthesis means the drawing together and creation of oneness, a unity out of disparate parts. You will find that is the aim of the evolutionary process: unity in diversity, the greatest diversity in the fullness of unity. I come to tell you that My Plan proceeds smoothly and well. All proceeds to plan; all My hopes are being fulfilled, and the Day of Declaration draws near. When men look back on this time they will see it as the dark night which precedes the brightest dawn and will be glad to have lived at this eventful period. If you read the messages from Maitreya that are published (Messages from Maitreya the Christ, Tara Press), I think you will understand every single word, and so it will be on the Day of Declaration. He will speak in the simplest terms, not about esotericism. He might mention briefly, in simple terms, the Path of Initiation as the final phase of life on this planet. He will talk about a readjustment of our view of the nature of life, its meaning and purpose, why we are here, in terms which everyone can understand. The world awaits the Declaration of the Christ. This great event, unique in history, will herald the beginning of the new era. It will vouchsafe, too, the end of man’s anguish and the beginning of new triumphs for men. When men follow the Christ, which indeed they will, they will come into that birthright which awaits them, and receive from Him the accolade of Joy and Peace. On that glorious day men will know, beyond all gainsaying, that their long wait has not been in vain, that help, indeed, is at hand, that the Teacher is ready to aid and guide. That He comes as an Elder Brother rather than a Saviour, ready to take the lead to save our planet, and to enable men themselves to restore sanity to their lives and ways of living. I am with you once more, My dear friends. Hopefully, My face will soon be seen by many of you, but, in any case, on the Day of Declaration the world will know that I, Maitreya, Son of Man, now dwell among you. I have come to show you the possibilities which, as sons of God, lie before you. My heart knows your response, teaches Me your choice, and awakens great gladness. My friends, My people are everywhere, preparing for the New World. Their task is great, their burden heavy, their opportunity unknowable. Many there are now who see the way forward, hold before men the Light of Truth, teaching men to share and love, to cherish and trust. Many now are awake to these divine aspects, and call for the restructuring of your world. My Force is behind them. My Love inspires them. My Will guides them. In this way, I lead you into the New. When you see Me, you will know that I have been always with you, never far from your awakened heart. Know this and trust that in this coming time I shall never leave you, shall be with you always, to the end of the Age. The time is short indeed till God’s day of triumph. Believe this and work as one to tell the world that I am among you. Do this for Me, My friends, and know the true joy of service to your brothers. I call on you to make known at this late date that I, the Lord of Love, now walk among you. My friends, the time is short. Many hands and many voices are needed to proclaim this truth. I know already those on whom I may count. A final effort, My friends, and all will be as I have promised. Called by SHIFT magazine, an independent non-profit magazine focused on economic and ecological sustainability, the most important grassroots movement today, Degrowth represents an international alliance of organizations, groups and private individuals seeking to address the main challenge of our time: to bring our unsustainable economic systems, dependent on endless growth, into harmony with nature on a finite planet. A recently published book of essays compiled by members of the Autonomous University of Barcelona, Degrowth: A Vocabulary for a New Era is the first book in English to offer a complete overview of this developing new approach in all fields of academic thinking. Integral to the Degrowth ethos are three key ideas: conviviality, dematerialization and simplicity. Ivan Illich, whose philosophy inspired many of the original ideas of the movement, defines ‘conviviality’ as “individual freedom realized in personal interdependence” or living together peacefully in a creative and collectively self-determined way. ‘Dematerialization’ represents the setting of absolute limits for the use of materials and energy, seen by many experts as essential to solving the ecological crises facing the planet. The beauty and strength of the new vocabulary introduced in the book reflects a style of economic thought that links ideas like environmental justice, sharing, co-operatives, eco-villages, debt-free money, simplicity and the commons. The expression ‘nowtopians’ defines a people who share an experience of autonomous living and producing together, evidenced in Transition Towns, collaborative consumption, share schemes, etc. The term ‘public money’ defines a system that would no longer borrow money from private banks. Such vocabulary aims to link ancient traditional wisdom with scientific research, social activism, and innovative social practices, into a much needed proposal for a future where economic growth will no longer be seen as an imperative for the global economy. An optimal distribution of resources throughout society would help all people to recognize each other as peers. In a Degrowth world, this optimal distribution is connected to the idea of voluntary simplicity, as Samuel Alexander writes, “based on the assumption that human beings can live meaningful, free, happy and infinitely diverse lives, while consuming no more than an equitable share of nature”. Giacomo D’Alisa, Federico Demaria, Giorgios Kallis: Degrowth: A Vocabulary for a New Era. Routledge 2014. Alex Pentland: Social Physics: How Good Ideas Spread – The Lessons from a New Science. Penguin Group 2014. (Editor’s note: We would like to add the following comments which provide some Hierarchical insight into the need to create inclusive structures in all fields. Gideon’s Promise is an Atlanta, Georgia-based nonprofit organization founded in 2007 that works to bring just and competent legal representation to people charged with criminal offenses. The group trains public defenders (court-appointed defense lawyers who represent individuals who are unable to afford a lawyer) to better serve their clients. Gideon’s Promise works in 16 US states and has received countless awards over the years for its work. Ilham Askia is Executive Director and co-founder of Gideon’s Promise. Jason Francis interviewed her for Share International. Share International: Could you explain the two systems of legal justice that exist in the United States? Ilham Askia: From our point of view, if you have money you will immediately hire the best lawyer you can find. And you will likely be released to resume your normal life. You are afforded the presumption of innocence and all the protections that citizens should receive. So if you have money you will get everything the US Constitution has granted and all of the accommodations that will be made for someone of means. However, if you are poor you are likely going to be held on a bond [bail] that you can’t make. You will sit in jail, although presumed innocent, waiting for a chance to tell your story. More than likely you will be given a public defender who is overwhelmed and under-resourced and may not be able to visit you for days and sometimes even weeks. Although you might be innocent this pretrial experience could cost you your job, and you might lose your housing and your reputation. It’s unequal and unfair. If you are poor in this country you are not guaranteed the same due process as a person of means. SI: How vulnerable are minority groups in America’s legal justice system? IA: If you come from a minority – and we’ve seen a lot in the news lately about racial profiling [law enforcement targeting people for suspicion of crime based on race], which is still in existence and strong – you are treated differently. You are viewed as someone who is less than human at times. So a lot of what ails the criminal justice system is related to race and class. If you go through any community, especially communities of color, you will see that there is a bigger police presence. The people of color and minority groups are monitored, arrested and prosecuted more. A huge percentage of the minority population is in the [criminal justice] system today. SI: Why do people who are innocent plead guilty to crimes they did not commit? IA: People do not know the process from the time they are arrested to the time they go to court. You get arrested; you don’t understand what is going on in the courtroom surrounding you; and you sit in jail for days and sometimes months because you can’t afford to pay the bond. You are sitting there saying: “I need to get home to my loved ones. I need to get back to my job.” People frequently plead guilty just to get out of jail. If a prosecutor comes to you and says: “If you just plead guilty I will give you probation and you can go home today”, versus possibly facing 10 years in prison for this charge, most people will plead guilty to a crime they did not commit so they can go home. Sometimes they don’t understand the collateral consequences of doing so. Although the client may decide to take that plea deal and they get home, now they have a conviction on their record. If they try to get another job their criminal record makes it impossible. Their existing job may not allow employees to have a conviction so they are out of work. And it becomes a cycle. They can no longer afford to pay the restitution. I have often met clients who were required, as part of taking the plea, to enter a drug program. The drug program costs money and they can’t afford it because they’re unemployed. So they violate the terms of their probation and end up back in court facing the charge and possibly jail time. Unfortunately, this is very prevalent in poor communities and it’s happening to people of color. SI: What is the ‘Prison Industrial Complex’? IA: The Prison Industrial Complex is a business. It is the way corporations use prisons to make money. What is happening in many areas of the country is that the more beds you fill in a prison and if a prison is filled to capacity – think of it as a hotel, but a hotel where people cannot get out – there is an economic incentive to arrest people and prosecute and punish more because it is a business. In some states if a prison is full, a percentage of that income goes back to the state. If we are getting funding from these prisons, why not fill them to capacity? That’s what is happening. The problem is that people are being prosecuted for very minor offenses to fill these prisons. And sometimes the campaigns of judges, prosecutors and lawmakers benefit from this industry. [In the US, many judges and prosecutors, like politicians, often have to be elected, which requires one to run an election campaign for votes.] As a consequence you see a lot of the “tough on crime” policies that also help to usher people into the system. The states or police enforcement are often very aggressive in rounding up and locking up people to make these quotas. I see it a lot. Sometimes if you look at the monthly quotas, the number of the people being arrested are for minor offenses in order to fill the jails. It is a huge moneymaking industry for the prisons or the institutions. SI: Could you discuss the changes that need to be made in America’s legal justice system? IA: One challenge that we have is financial. The challenge is that states have not lived up to the promise of Gideon. It takes resources to pay for investigators, expert witnesses, and other expenses to represent a client well. We just need more funding. States need to allocate more funding in their budgets for public defense in order for attorneys to honor the promise of Gideon. Structurally, public defenders need to have independence. They must be free to devote themselves to their clients. In many places there are serious structural barriers that prevent our attorneys from doing their jobs well. Judges appoint a lot of our attorneys. And those judges have control over the public defender office. So if a lawyer fights too hard the judge might not give them cases or may try to replace the attorney for not processing quickly enough. In some places, for example Alabama, there are part-time public defenders. So they get a flat rate and would rather spend more time on their paying clients. Structurally, if we can have systems where the public defender really gets to work with their clients and own their office then I think changes can happen. Another area, which Gideon’s Promise focuses on, is the cultural change of the system. In the criminal justice system the emphasis is on speed not justice. Our defenders enter with a lot of passion. They want to do good work. They want to help people. But they are fighting against burn-out. Having caseloads of 300 to 400 a year and not being given the right tools to do their job well, they start to suffer from burn-out. We have to ensure that they don’t lose that passion. We need to change the culture of processing people and the dehumanization of clients. Making them whole again is part of that change. And not just in the public defender’s office, but changing the mindset of judges and prosecutors to see public defender clients as people. That’s the part that we really focus on – challenging the systemic pressures that treat people as less than human. SI: Is there anything further you would like to add that we haven’t discussed? IA: We have been celebrating a lot of milestones recently. We had the 50th celebration of the March on Washington. [In 1963 about 250,000 people marched on Washington DC calling for civil and economic rights for African Americans.] We celebrated the 50th anniversary of Selma. [Three marches took place between Selma and Montgomery, Alabama, in 1963, which helped lead to the Voting Rights Act that prohibited racial discrimination in voting.] The Civil Rights Movement is a huge part of our history and made significant changes to the fabric of this country. This generation needs to focus on the Civil Rights Movement happening now. The Civil Rights Movement of this generation is dealing with criminal justice issues and criminal justice reform. It’s really important that people understand that although we have come a long way since Selma, Birmingham and the Montgomery Bus Boycotts, we still have far to go because there are poor people and people of color who are treated differently in this system. Their lives and liberty are taken away. So, what we tell our public defenders when they come into our program is that they are part of a movement. They may not understand what the impact of their work is now – of going to court every day and zealously advocating for clients – but in 50 or 60 years people will understand that they were the movement of public defenders that really fought against the status quo. We need to do something about the problems plaguing our communities and the very broken system we have in this country. On 18 June 2015 Pope Francis released a 192-page Encyclical letter, On Care for Our Common Home, urging rich nations to change direction, address inequality and poverty, and avoid climatic destruction. Written for all people, not only Catholics, the Pope calls on humanity for urgent action to save the planet. This is a major and heartening intervention at this historic moment, which brings together the scientific and moral aspects of climate change and global inequality. As expected, in the wake of the economic crisis and high-profile corruption scandals which have tarnished the reputation of the traditional political parties in Spain, the country has now entered a new political era. Spain’s indignados made the move from city squares to the halls of power on 24 May 2015 in municipal and regional elections that saw an anti-poverty activist elected as mayor of Barcelona and the ruling People’s party battered at the ballot box. Ada Colau, the 41-year-old anti-eviction activist who leads Barcelona En Comú (Barcelona In Common), was elected mayor of the Catalan city. “It’s a victory for David over Goliath,” said Colau as news broke of the historical win. “I want to be a mayor at the service of the people, so there will never again be first-class citizens and second-class citizens in this town,” she added. In Madrid’s municipal election, the outcome of the 24 May 2015 vote was less certain. The ruling Popular Party (PP) came out on top, but not by a sufficient margin to guarantee that its candidate, the veteran politician Esperanza Aguirre, would become the new mayor of Spain’s capital. Instead, Manuela Carmena, a retired judge, will become mayor with the support of the Socialists. As the last votes were being counted around midnight, Ms Carmena, 71, thanked her supporters, saying: “The victory is yours.” She said that she would work hard to “seduce those who didn’t vote for change”. The 71-year-old former judge and communist was enjoying her retirement last year when friends asked her to run for mayor of Madrid. She could now wrestle power from the PP if her party were to form an alliance with the Socialists. “The vote for change has won a majority,” she said. The strong showing of the leftist coalitions in Madrid and Barcelona suggest that the agendas of Spain’s two largest cities will be driven by the priorities of anti-establishment parties with roots in Spain’s indignado movement. The message that emerged was clear, with Spaniards voting to end the two-party dominance that has characterized Spanish politics since the death of Franco. With 90 per cent of the vote counted in the 24 May elections, the PP and the Socialists had taken 52 per cent of the nationwide vote, a significant drop from the 65 per cent the two mainstream parties earned in elections four years ago. While the PP was the most voted party in nine regions, it failed to obtain any absolute regional majorities. Many voters, unconvinced of the party’s message of an economic rebound and fed up with austerity, sky-high unemployment and a constant barrage of corruption scandals, turned instead to anti-austerity party Podemos and centre-right Ciudadanos. As Spanish politics widen into a four-way race, the shifting landscape means coalitions and compromises between parties will be necessary to govern. The elections underlined the rise of Podemos, a far-left party that was founded in 2014, but has since led the crusade against corruption among established parties. Podemos backed both Ms Colau and Ms Carmena. Pablo Iglesias, the national leader of Podemos, told supporters that “the big cities are the big engine of change in Spain”. He said the 24 May election results amounted to “a magic and historic night” that showed Spain’s bipartisan system was coming to an end. Thousands of protestors have been gathering nearly every Saturday since April 2015 in Constitution Square in Guatemala City, Guatemala’s capital, calling for an end to corruption and the resignation of the country’s President Otto Perez Molina. The protests are taking place in response to multimillion-dollar government corruption scandals, the resignation of the country’s vice president, and the jailing of dozens of suspects. Amid increasing public pressure on the government, Guatemala’s Supreme Court recently ruled that a congressional inquiry could move forward, possibly leading to impeachment proceedings against Perez Molina. In a country facing chronic problems including an extremely high homicide rate, gang violence, widespread poverty and child malnutrition, the spectacle of government officials enriching themselves in corruption schemes was a tipping point, according to Adriana Beltran, a security analyst at the Washington Office on Latin America, a US-based organization that promotes human rights in the region. “That there is something seismic happening below the surface is undeniable. When it will play out, how it will play out, what it will look like – having covered these things in the past – it is impossible to predict,” said Chris Hedges, senior fellow at the Nation Institute – a nonprofit media centre dedicated to strengthening the independent press and advancing social justice and civil rights. There is a mass shift in values that is happening underneath the surface of the normal. Hedges is also an activist, author, Presbyterian minister and humanitarian, and he foresees a coagulation of protest movements on the horizon that will provide the driving force behind the necessary changes: “You know as a reporter the tinder is there; you never know what ignites it. Even the purported leaders of the movement don’t know what the spark will be – it is a mysterious force.